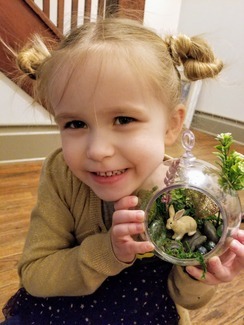 Come and join us for this airplant bunny terrarium activity. We will be using artifitial plants and an airplant to create a beautiful hanging or table top terrarium. The hanging terrariums are plastic and safe for kids to handle. There is a $5 class fee that is due at sign up that will go towards your class fee. Please enter throught the west ramp door.